Top Deadbolt – approximately 1” wide by ½” thick deadbolt, the top bolt provides additional stability to the top corner of the door. 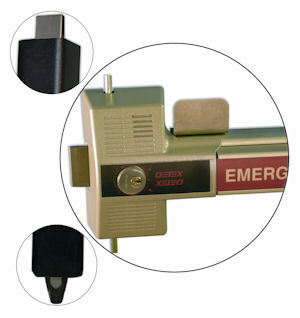 Side Deadbolt – 2 ¼” tall by ½” thick deadbolt with a 1” throw allows for ¾” penetration into strike (Detex recommends Flush installation for maximum security). With 1.6875 square inches of bolt engagement, the side deadbolt provides superior defense against pulling and prying on the side of the door. Bottom bolt – 5/8” HEX bolt with ¾” throw, engages the floor with 5/8” penetration provides better attack resistance and superior defense against the “peeling up” of the bottom of the door. Together, the 3 bolts withstand 10,000 lbs. of pull force.